Aihole (Kannada ಐಹೊಳೆ) is a town in the Bagalkot district of Karnataka, India. Ancient inscriptions reveal the earlier names "Ayyavole" and "Aryapura" for the town. Historically significant, Aihole has earned the title cradle of Hindu rock architecture. The Chalukyas created their style of rock architecture by bringing together northern and southern India styles. Numerous temples and caves of historical importance populate Aihole, making the site one of the highest traffic spot for visitors in north Karnataka. The temples fall broadly into two groups, the Kontigudi and Galaganatha. The Durga temple stands as the most famous of the Aihole temples, built similar to a Buddhist chaitya. 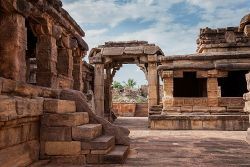 The first phase of temple building in Aihole dates back to the sixth century C.E., the second phase up to the twelfth century C.E. Some temples were even built as early as the fifth century C.E. The first capital of the early Chalukyas, artisans designed and constructed more than 125 temples in a variety of architectural styles. Craftsmen used the location as a laboratory to experiment with rock cut architecture. They gained experience in their craftsmanship, moving on to build the great temples of Pattadakal. Aihole lies to the east of Pattadakal, along the Malaprabha River, while Badami sits to the west of both. 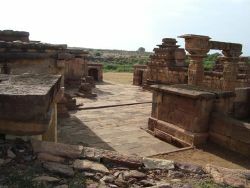 Pulakesi I, one of the greatest rulers of this dynasty, moved the capital to Badami which had been known as Vatapi at that time. The early Chalukyas inherited architectural styles mostly from their neighbors to the north and south of their kingdom. The practice of using curved towers decorated with blind arches came from northern India. Pilastered walls with panel inserts constitute a southern Indian style. Deccan style consists in balcony seating, angled eaves and sloping roofs, and elaborately carved columns and ceilings. In short, they brought together the prevailing architectural styles in their neighborhood to create the Chalukyan style. Typical features unique to Early Western Chalukyan architecture include mortar-less fitting of stone, an emphasis on length rather than width or height, flat roofs, and richly carved ceilings. Sculpturally, they placed an emphasis on relatively few major figures, which tend to stand placed in isolation from each other rather than arranged in groups. The aesthetic sensibility of sculpture from that period retained an impulse toward a classical style that failed to transmit into later periods of Indian art. 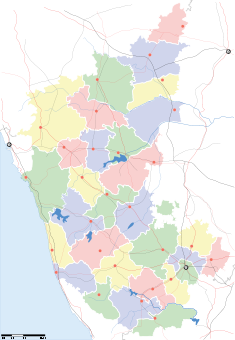 The prominent temple groups include the Kontigudi group and the Galaganatha group of temples, although historians have divided all the temples into twenty two groups. A group of three temples has been referred to as the Kontigudi group of temples. One of those temples, the Lad Khan temple, had been named after a mendicant that lived there in the nineteenth century. The Huchiappayyagudi temple and the Huchiappayya temple complete the trio of temples. Lad Khan temple consists of a shrine with two mantapas in front of it. The shrine bears a Shiva lingam. The mukha mantapa in front of the sanctum has a set of twelve carved pillars. The sabhamantapa in front of the mukha mantapa has pillars arranged in such a manner as to form two concentric squares. Stone grids on the wall portray floral designs. Built in a Panchayat hall style, the temple construction reveals one of the first experiments in temple construction in Aihole. The windows, filled with lattice style, reveal a north Indian style of architecture. The temple had been built in late seventh or early eighth century. Huchappayyagudi temple has a curvilinear tower (shikhara) over the sanctum (unlike the Lad Khan temple). The interior of the temple has beautiful carvings. Huchimalligudi temple at Aihole, built in the seventh century, shows an evolution in the temple plan with an ardhamantapa or an ante-chamber annexed to the main shrine. The Galaganatha group sits among nearly thirty temples on the bank of the river Malaprabha. The main temple of the Galaganatha temple enshrines Shiva—Galaganatha has a curvilinear shikhara, and has images of Ganga and Yamuna at the entrance. Durga temple or fortress temple embodies the most famous of the Aihole temples and most picturesque of the temples. Apsidal in plan along the lines of a Buddhist chaitya, Durga presents a high moulded adisthana and a tower—curvilinear shikhara. A pillared corridor runs around the temple, enveloping the shrine, the mukhamantapa and the sabhamantapa. All through the temple, beautiful carvings abound. The temple had been built during the late seventh or early eighth centuries. Meguti Jain temple, the only dated monument built in 634 C.E., stands on a hillock. The temple sits on a raised platform with a flight of steps leading to the large, pillared mukhamantapa. A flight of stairs leads to another shrine on the roof, directly above the main shrine. From the roof, the devotee had a panoramic view of the plain with a hundred temples or so. The temple, which may never have been completed, provides important clues of early development in Dravidian style architecture. The dated inscription, found on the outer wall of the temple, records the construction of the temple by Ravikeerthi, a scholar in the court of emperor Pulakeshi II. Ravanaphadi temple is a rock cut temple, with a rectangular shrine, hosting two mantapas in front and a rock cut Shivalingam. The temple dates to the sixth century C.E.. Ravanphadi cave sits south-east of Hucchimalli temple. A Shaivite cave temple, its sanctum is larger than that of the Badami Cave Temples. The sanctum has a vestibule with a triple entrance and carved pillars. Gowda temple dedicated to goddess Bhagavathi, had built on similar lines as the Lad Khan. It has sixteen plain pillars. Temple had been built earlier that only earlier Khan temple. Suryanarayana temple has a .6 meters (2.0 ft) high statue of Surya along with his consorts, Usha and Sandhya, drawn by horses. The temple, dating from the seventh or eighth century, has a four pillared inner sanctum and a nagara style tower. Museum & Art Gallery is a sculpture gallery maintained by the Archaeological Survey of India in the Durga Temple complex. ↑ Art and Archaeology, Monuments of India, Part II, Early Chalukya, Aihole. Retrieved January 24, 2009. ↑ John M. Fritz, George Michell, and M. S. Nagaraja Rao, Where Kings and Gods Meet: The Royal Centre at Vijayanagara, India (Tucson, AZ: University of Arizona Press, 1984), 56. ↑ Surendra Sahai, Indian Architecture: Hindu, Buddhist, and Jain (New Delhi: Prakash Books, 2006), 77. ↑ Susan L. Huntington and John C. Huntington, The Art of Ancient India: Buddhist, Hindu, Jain (New York: Weatherhill, 1985). ↑ Seminar on the Chalukyas of Badami, and M. S. Nagaraja Rao, The Chalukyas of Badami: Seminar Papers (Bangalore: Mythic Society, 1978), 58. ↑ ʻAlī Jāvīd and Tabassum Javeed, World Heritage Monuments and Related Edifices in India (New York: Algora, 2008), 112. Fritz, John M., George Michell, and M. S. Nagaraja Rao. 1984. Where Kings and Gods Meet: The Royal Centre at Vijayanagara, India. Tucson, AZ: University of Arizona Press. ISBN 9780816509270. Huntington, Susan L., and John C. Huntington. 1985. The Art of Ancient India: Buddhist, Hindu, Jain. New York: Weatherhill. ISBN 9780834801837. Jāvīd, ʻAlī, and Tabassum Javeed. 2008. World Heritage Monuments and Related Edifices in India. New York: Algora. ISBN 9780875864822. Michell, George, and Mark Zebrowski. 1999. Architecture and Art of the Deccan Sultanates. The new Cambridge history of India, I, 7. New York: Cambridge University Press. ISBN 9780521563215. Sahai, Surendra. 2006. Indian architecture: Hindu, Buddhist, and Jain. New Delhi: Prakash Books. ISBN 9788172341299. Seminar on the Chalukyas of Badami, and M. S. Nagaraja Rao. 1978. The Chalukyas of Badami: Seminar Papers. Bangalore: Mythic Society. OCLC 5945134.